The Theatre Centre is a performing arts organization in Toronto, Ontario. Four years ago we repurposed a former Carnegie library into a hub for cultural purposes and public use. In addition to two performance spaces we also have a cafe, a bar, a free library, gallery spaces, and a small shop where local artists can sell their work. The cafe is central to who we are and how we are redefining the role of a theatre. We use the cafe to invent new ways to reach our neighbours and meet them where they are. By opening the doors at 8AM (instead of right before a performance at 8PM), offering delicious baking, free wifi, and a welcoming space, we are able to invite people in. 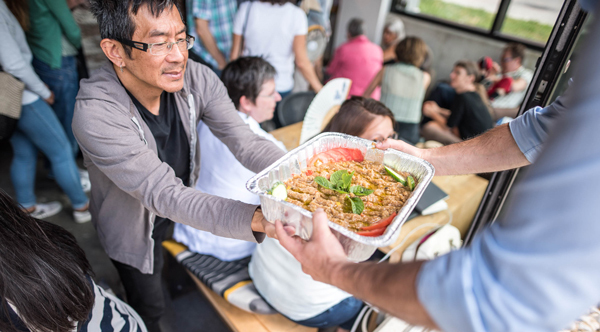 Our most beloved offering is the Community Meal where community members gather to catch up, meet new people and share a delicious, healthy, $5 lunch. The Community Meal began in 2015 when a member of staff, Remington North, wanted to share his love of cooking by making ramen for the staff. 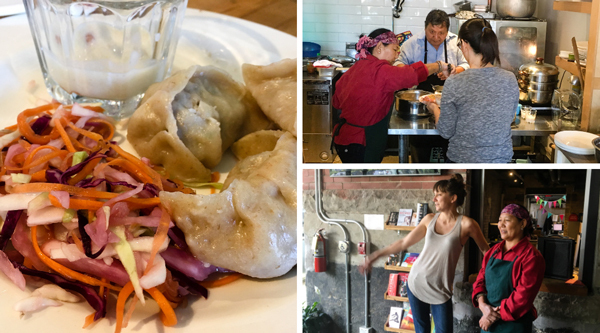 When we all sat down to eat, a few patrons in the café asked “what smells so good?”, so we grabbed them a bowl and a spoon and the Community Meal was born. The next month we opened the lunch up to the world and Remington set about preparing his famous ribs. After that word got out and people were hooked. We soon started selling out of food, running out of seats, and had a line-up long before the 1:00pm start time. When our neighbours come in to share a meal with us, they are also engaging in conversations about city building and the arts. Other artists and community groups have come to realize the value of these connections, and since our serendipitous beginning, many others have hosted meals in our home. To date, guest hosts include performing art groups such as Why Not Theatre, Volcano Theatre, Nightwood Theatre and Sulong Theatre, Nova Dance, SummerWorks, and Little Black Afro; individual artists including photographer Dahlia Katz and musician Njo Kong Kie; community groups such as The Centre for Mindfulness Studies, York University’s Faculty of Environmental Studies; and organizations from the neighbourhood including Milky Way Gardens, Parkdale Neighbourhood Land Trust and Greenest City. Recently, we have been forced to put the project on hold as seed funding for this program has ended. Support from the Aviva Community Fund will allow us to relaunch the Community Meal. The Theatre Centre is a public space, open and accessible to the people of our community, where citizens can imagine, debate, celebrate, protest, unite and be responsible for inventing the future. The Theatre Centre’s Community Meal is one of the most welcoming ways for us to share our space with artists, friends and neighbours. Please help us save the Community Meal and vote for us today!